Can you identify the location, date or individuals ? This photo was supplied by Karl Plenge, a descendant of Edward Jordan, b.1806, Ireland, a sailmaker of Charleston, South Carolina. 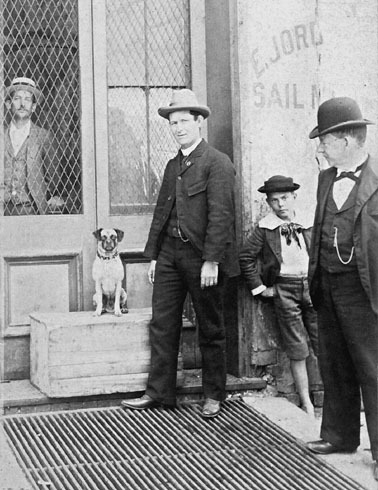 The photo is thought to have been taken on a wharf in Charleston after 1900. It is not known if any of the individuals were members of the Jordan family. Ed is believed to be the father of Sarah Ann Jordan who married Reverend William James Edwards Fripp on 29 June 1858, at the Cumberland Church, Charleston, S.C. However, she is not recognised as Ed's daughter on any census and there are other puzzling issues. A full explanation is contained in her notes here.